Shimano XT SPD's are designed to take the rigours of off-road competition as well as being perfect for cross country trail riding. Lightweight and high performance forged alloy body, chrome-moly axle and a revised cleat interface for increased stability. Constructed with a strong and slender spindle using an 8 mm Allen wrench mounting system. Easy entry system and tension adjustment provides plenty of support and holds the cleat firmly in place. Large integrated cage provides excellent pedal to shoe contact increasing stability and control. Slim, oval axle body housing sheds mud efficiently and reduces mud cling on. Revised cleat interface for increased stability. Easy entry system and adjustable cleat tension. Great pedals. Very easy to clip in while on the go. 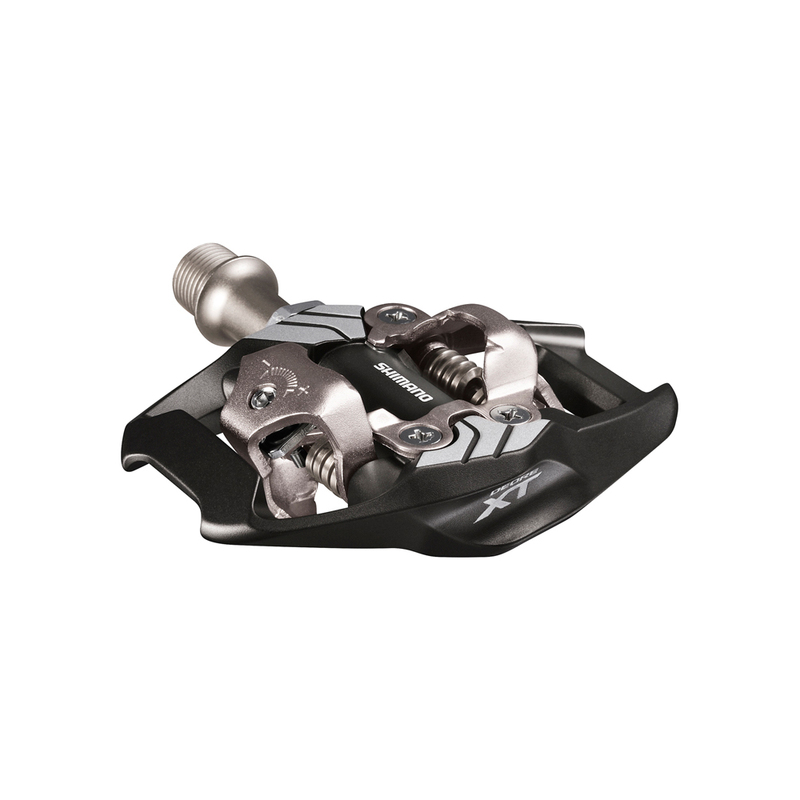 The extra frame on the trail version of this pedal really does help to guide your foot onto the pedal and makes sure its in the proper orientation to clip in. Really happy with the Shimano XT M8020 SPD Trail Pedals. Recently installed these on my Cannondale road bike, they both look good and have a great feel to use, good foot support and easy to click-in click-out. Good delivery service to Australia also through Merlin Cycles. Very good pedals. Double sided so very easy to click in and out of. I use them on a road bike and find them ideal. I always slacken of the clips fully and then tighten them 3 clicks and find them tight enough for me. Vey quick and reliable delivery from Merlin as always. Great pedals! Amazing support, easy to clip in, came quickly and at the cheapest price I could find. Would recommend!! Love these pedals. Great construction and last incredibly well. Feel secure to clip in and clip out. Great value too. Can't go wrong with SPD's. Been running them on all my MT and Gravel bikes since the day they were introduced. Reliable and bullet-proof.